Dr. Cares – Family Practice is an awesome adventure simulator from Nitreal. Amy’s mom is back in town, and Amy has to choose between Jack and the clinic, or her mom. Show off your skills as an animal doctor. There’s more than just puppies and kitties that need your help, as you turn your attention to ponies, and even dolphins, along with an assortment of wild animals around Snuggford. 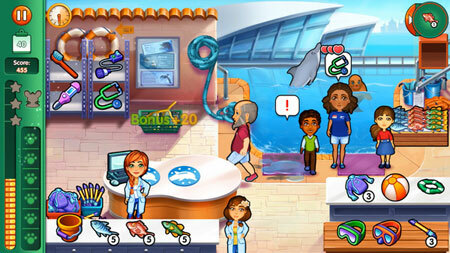 Gain professional vet skills as you master exciting mini games. Treat animal emergencies through 60 wild levels and an additional 30 challenge levels. Become a marine biologist, across 6 amazing locations. Earn diamonds to buy more things for your pets. Find out what’s happening in Snuggford, and save the ecosystem. You not only get to heal animals, but also make the choices and determine what happens. There are many decisions to be made, and each one will have an impact on the story and how it ends. If you get stuck in the game, check out the video walkthrough and gameplay for the game. This entry was posted in PC Games, Walkthrough and tagged Dr. Cares - Family Practice Cheats, Dr. Cares - Family Practice Gameplay, Dr. Cares - Family Practice Guide, Dr. Cares - Family Practice Hints, Dr. Cares - Family Practice Tips, Dr. Cares - Family Practice Walkthrough by Marvin. Bookmark the permalink.